Hyacinth plants provide stately blooms along short flower stalks in spring. Growing these bulb plants indoors allows you to force them into bloom in late winter so that you do not have to wait to enjoy their beauty. The bulbs are good for only a single season in pots, but planting them out to the garden after blooming allows them to continue and grow for many years. 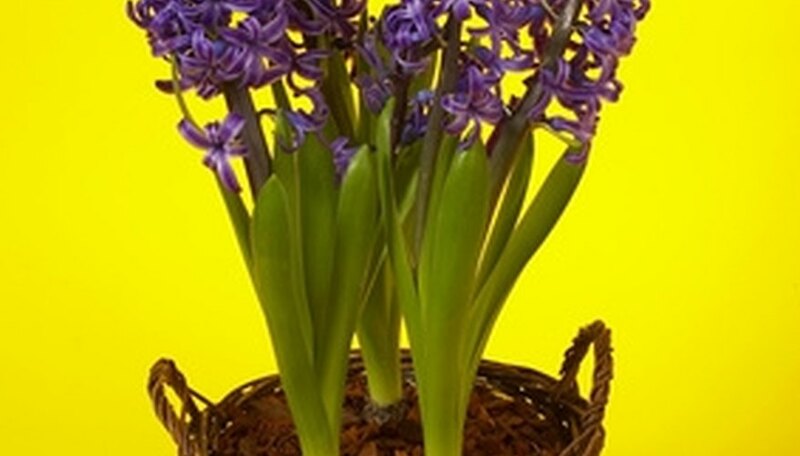 Add potted hyacinth to your indoor spaces and invite a bit of spring color into your home. Fill a 4- to 8-inch-diameter pot 2/3 full with a well-drained peat-based potting mixture. Use a pot that has at least one drainage hole in the bottom. Set the hyacinth bulbs on top of the planting mixture, pointed end facing up. Adjust the depth of the potting mixture as necessary so that the tops of the bulbs set ½ inch beneath the rim of the pot. Space the hyacinth bulbs 1 to 2 inches apart in the pot. Fill the pot with additional potting mixture until the tip of the hyacinth bulb is right at or just beneath the soil surface. Water the potting mixture from the top until the water begins to drain out of the bottom of the pot. Set the watered pots in a location whose ambient temperature is 35 to 45 degrees F for 13 weeks. Bring the plants out of cold storage and place them in a 60-degree-F room where they can receive bright, direct sunlight. Water as necessary to keep the soil moist but not soggy. Move the hyacinth to a bright area that receives indirect sunlight once the flowers begin to bloom. Let the foliage on the hyacinth die back naturally after blooming, then replant the bulbs in the garden. They will resume blooming within two years when planted outdoors. Hyacinth bulbs contain oxalic acid, which is toxic. Wear gloves when handling the bulbs to avoid skin irritation.